There are a ton of social channels out there, seemingly more by the day. It’s hard to stay on top of it all. Of course, logging into all of those various platforms and managing them individually doesn’t make sense, so finding an all-in-one tool to manage and monitor them is going to improve workflow and help you get the most out of a valuable marketing channel. There’s no doubt that social media marketing has benefits for the company as a whole. 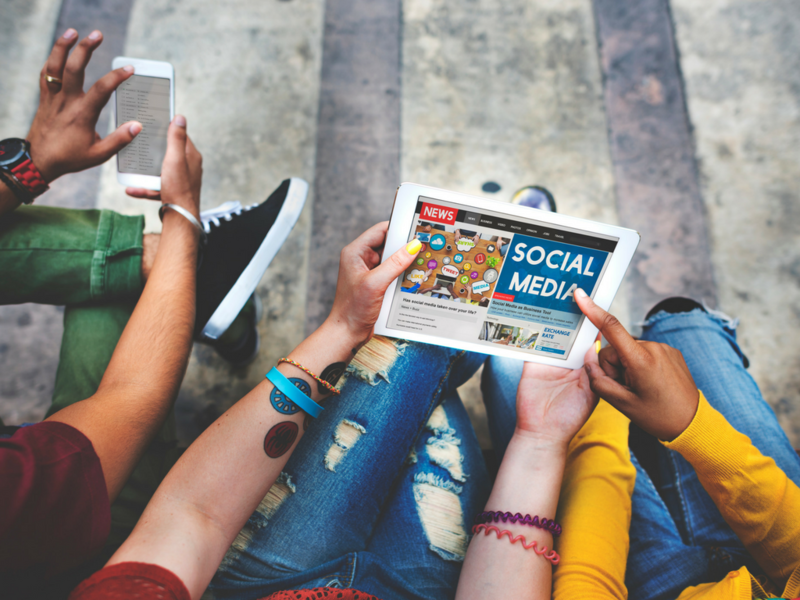 According to one study “97% of marketers are currently participating in social media—but 85% of participants aren’t sure what social media tools are the best to use.” But these efforts don’t always get the resources they need so find a tool that can manage everything is crucial. Additionally, you need to make sure that these tools offer what you need. Some combination of monitoring mentions, scheduled posting, reporting, and the price point is essential to smoothly running a campaign without too much heartache or lost opportunity. Just as it’s easy to be overwhelmed by your number of social accounts it’s easy to be overwhelmed by the number of tools that can help manage them. We’ll take a look at a few that cover all the bases, including nTuitive.social, HootSuite and EveryPost. Keeping track of what people are saying about your company and topics relevant to your company is vital to your brand’s integrity. Researching potential customers ensures that you spend time and money in the most effective way. You also want to understand how people interact with your posts, otherwise, you’re throwing money against a wall and hoping it sticks. While HootSuite and nTuitive.social both provide the capability to monitor social channels based on topical or trending criteria, there are nuanced differences in filtering and segmentation. 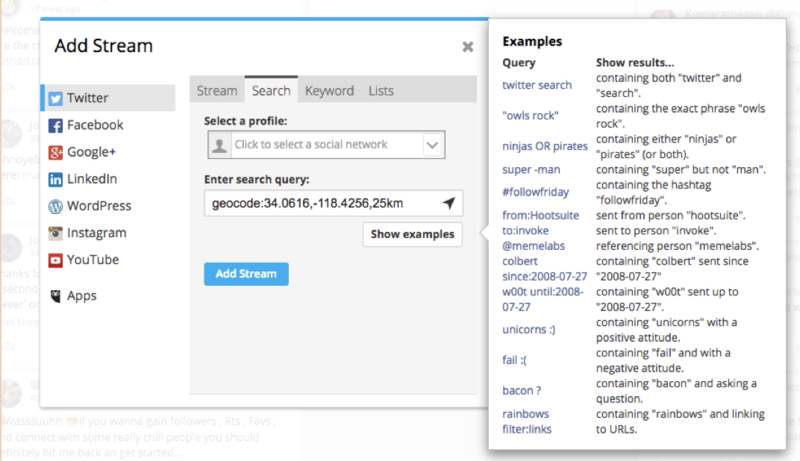 HootSuite allows you to filter by demographic, location, language, and gender. This allows you to keep tabs on brand sentiment, particularly with the audience you care about the most. This platform also allows you to check out conversations on blogs and forums to stay in the loop. 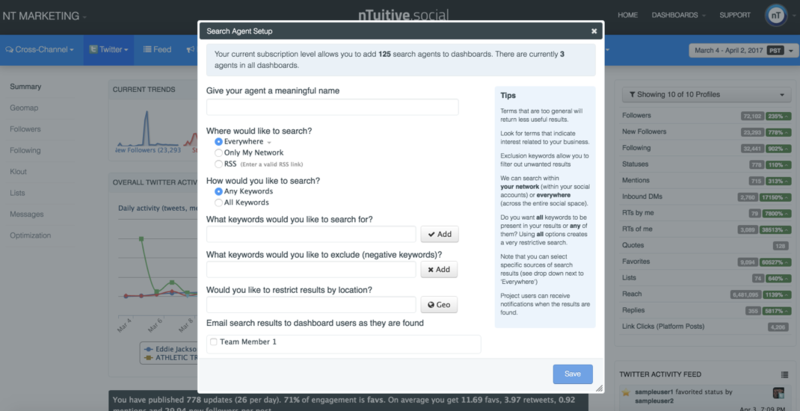 nTuitive.social allows you to monitor conversations by keywords, as well. They also give you the option to email results to team members and restrict results by location. This is pretty similar to what HootSuite is offering, however, their competitor analysis provides a unique edge. They pull in analytics from other profiles to give you insight when tracking competitors. No other platform currently has this feature along with all their other offerings at their price points, and keeping an eye on your competitors helps you stay ahead of them and puts you on the forefront. Unfortunately, Every post doesn’t have monitoring capabilities. So, if this is an important part of your tactical approach, it would be best to explore other options. The most utilized feature in most of these platforms is how they publish your content. HootSuite lets you manage content through a library of messages and allows you to target those messages to specific demographics. The publishing feature in HootSuite is considered an industry standard user-friendly tool to automate social postings. Like HootSuite, nTuitive.social also allows you to schedule posts from a library of messages. They do go a step beyond with quite a few features. One of which, called Evergreen, reuses your best content for more engagement. Additionally, it makes sure your queue is never empty. When a category is empty it re-shares past content that people may have missed. 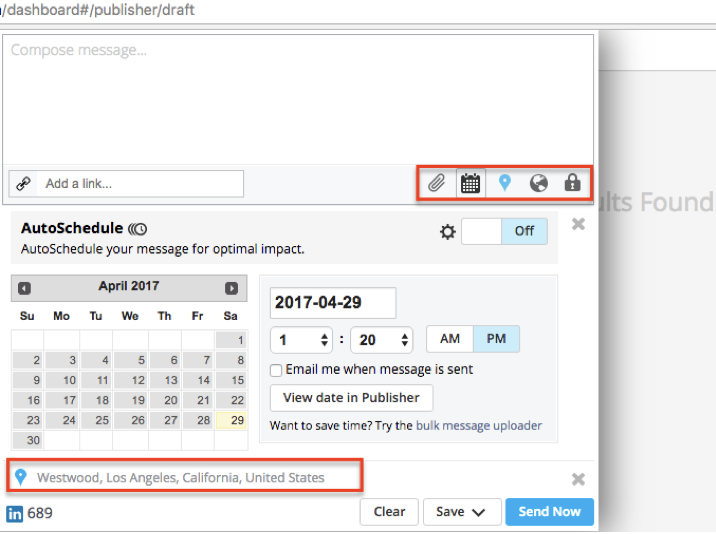 This feature takes the guesswork out of scheduling and ensures that a forgetful human doesn’t leave gaps in your social strategy. Everypost is geared towards curating visual content. 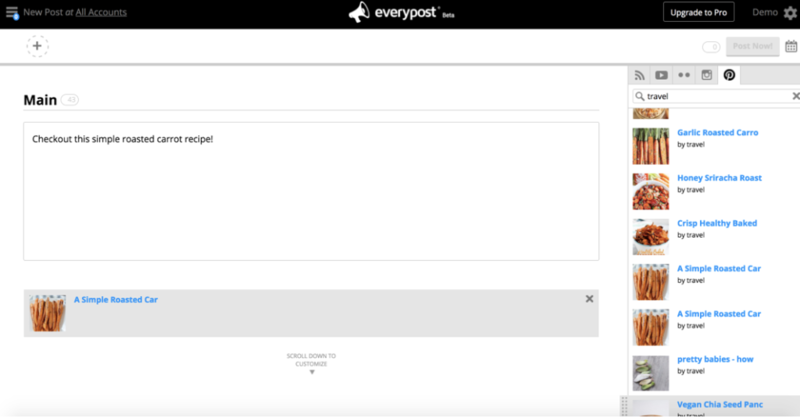 In addition to posting your own content, Everypost helps you pull photos and videos from different channels around the web and reshare them. Even a novice marketer will tell you that all of the features mentioned above are valuable tools to use in any effective marketing campaign. But only if you can afford them. All three of these platforms offer tier-based subscriptions, so finding what you need at what price might be the determining factor for engaging with one of these products. EveryPost is the cheapest of the three options, ranging from free to $99/mo. The free option doesn’t provide much but is probably great for a person trying out a social management platform for the first time. The Plus plan provides access for 5 team members and about 25 social accounts for $30 per month. Their premium “teams” subscription caps out at 25 users and 120 connected accounts for $99/month. When it comes to price and support, EveryPost may be ideal for a smaller operation looking to scale that doesn’t require much hand holding. nTutitive.social sits in the middle of the price range with plans from $29/mo for the Lite plan up to $375/mo for their Ultimate package with stops in between. At the base, you get access to all publishing features and 10 connected accounts, but you don’t get access to some main features. The Plus package at $199/mo offers the ability to track competitors, 100 connected accounts, and more reporting features. Surprisingly, nTuitive.social is pretty inclusive with its features starting at the $35/mo option where other platforms tend to limit premium features. So, if overall functionality is your objective, nTuitive.social may give you the most value for your money. HootSuite has a low entry point at $9.99/mo, but this option is intended more for personal use than business. The upper tiers can get steep if you plan on utilizing a team to carry out social marketing campaigns. Plans are paid by user, ranging from $34.99/mo per user up. The upside is a generous amount of features and customization for each user account, as well as 24/7 priority support for business subscriptions. The premium tiers, however, can become pricey for smaller operations looking to scale. When selecting an all-in-one social platform you need to examine your needs first. If you have fewer accounts or want to just do some basic posting, a platform like Everypost is going to give you what you need for a good price. But, if you want to expand those accounts and accelerate your social listening and engagement, tools like nTuititve.social and HootSuite have amazing features with competitive prices to serve your marketing needs without breaking your budget. Always do your research before selecting a platform, take advantage of free trials, make sure the tools fits your needs (not the other way around), and avoid the pitfalls of platform buyer’s remorse. very helpful as usual! thank you so much. Nice and analytical post on the uses of social media tools. I had no idea of the existence of NTuitive.Social and EveryPost.